Have you ever spent time outside in nature and discovered that the scent of nature brought back a memory? Plant fragrances play a significant, yet often subtle, role in our appreciation of the outdoors. While roots and bark emit some aromas, most fragrance is found in plant flowers and leaves (e.g. 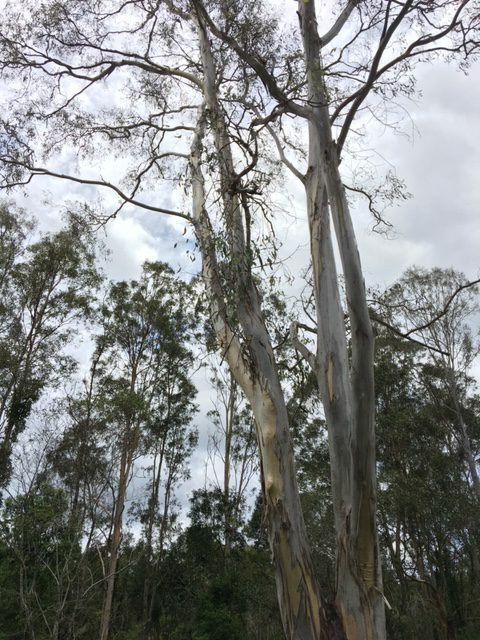 eucalypts) and might be released into the atmosphere on hot days or with heavy rain (Elliot 1996). Our weary spirit caused, in part by “techno-stress” and urbanization, has led to a society which is stressed and disconnected from the soothing effects of nature (Miyazaki et al. 2014) also known as Vitamin N (Louv 2016). Nature reconnection practices, which encourage improved lifestyle choices and better mental health in urbanized societies, include, but are not limited to, forest therapy, wilderness therapy and outdoor meditation (Liebeck 2016) and address the mental, physical, emotional, social, spiritual and environmental factors of human wellbeing (Pierce 2010). Forest Therapy, under the umbrella of nature or ecotherapy has existed in Japan since the Forest Agency of Japan promoted Shinrin-yoku (“forest bathing” or “luxuriating in the forest atmosphere”) as a practice for healthy living and part of a “forest therapy” program (Ikei 2014). Forests often deliver large amounts of olfactory-provoking chemicals, identified as phytoncides. Phytoncides are secondary metabolites produced by plants (such as cypress) and are closely related to essential oils (Li et al. 2006) which are likely to have a number of functions in plants including defense, helping with pollination, protection, allelopathy and antitranspirant activity. A guided Forest Therapy walk is likely to include natural aromatherapy and the inhalation of phytoncides. Inhalation of phytoncides consisting of tree antimicrobial volatile organic compounds such as α-pinene (which is found in eucalypts) and limonene (Li et al. 2006 and Halter 2018) can contribute to decreased stress, balance mental outlook (Selhub & Logan 2012) and improve immunity (Li et al. 2006). When next you are outdoors bathe in the fragrance of the trees and in addition, follow these 10 nature-inspired practices to de-stress. Ikei, H., Komatsu, M., Song, C., Himoro, E., & Miyazaki, Y. (2014). The physiological and psychological relaxing effects of viewing rose flowers in office workers. Journal of Physiological Anthropology, 33:6. Li, Q., Nakadai, A., Matsushima, H., Miyazaki, Y., Krensky, A.M., Kawada, T., & Morimoto, K. (2006). Phytoncides (wood essential oils) induce human natural killer cell activity. Immunopharmacology and Immunotoxicology, 28(2): 319-333. Louv, R. (2016). Vitamin N: The essential guide to a nature-rich life. Algonquin Books, New York. Miyazaki, Y., Ikei, H., Song, C. (2014). Forest medicine research in Japan. Nihon Eiseigaku Zasshi, 69(2), 122-35. Pierce, G. (2010). Ecotherapy, health counseling: application and theory. Nelson Education Ltd. Ontario, Canada. Selhub, E.M., & Logan, A.C. (2012). Your brain on nature: the science of nature’s influence on your health, happiness, and vitality. Harper Collins, California.